Meditation is a universal spiritual wisdom and a practice found at the core of all the great religious traditions, leading from the mind to the heart. It is a way of simplicity, silence and stillness. It can be practised by anyone, wherever you are on your life’s journey. It is only necessary to be clear about the practice and then to begin – and to keep on beginning. In Christianity this tradition of contemplation, the prayer of the heart or 'apophatic prayer', became marginalised and often even sometimes suspect. But in recent times a major recovery of the contemplative dimension of Christian faith -and prayer - has been happening. This is transforming the different faces of the Church and revealing the way the Gospel integrates the mystical and the social. Central to this process now is the rediscovery of how to pray in this dimension and at this depth: finding a practice of meditation in the Christian tradition. The World Community teaches a practice derived from the Gospel teaching of Jesus and the advice of early Christian monks. The Desert Fathers and Mothers teach a Christian spirituality of powerful relevance for those today who want to jive their discipleship to Jesus in a radical and simple way. 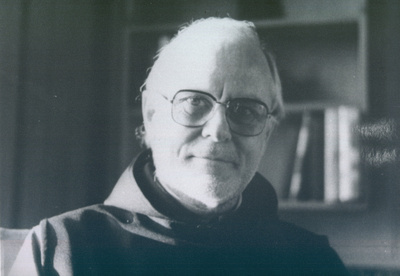 John Main and the community he inspired has had a major role in this contemporary renewal of the contemplative tradition. His own introduction to meditation came to him from the universal wisdom but led him to recognise and then go on to teach it as a way of prayer rooted in the Gospels and the Christian mystical tradition. Sit down. Sit still with your back straight. Close your eyes lightly. Then interiorly, silently begin to recite a single word – a prayer word or mantra. We recommend the ancient Christian prayer-word "Maranatha". Say it as four equal syllables. Breathe normally and give your full attention to the word as you say it, silently, gently, faithfully and - above all - simply. The essence of meditation is simplicity. Stay with the same word during the whole meditation and in each meditation day to day. Don't visualise but listen to the word, as you say it. Let go of all thoughts (even good thoughts), images and other words. Don’t fight your distractions: let them go by saying your word faithfully, gently and attentively and returning to it as soon as you realise you have stopped saying or it or when your attention wanders. Meditate twice a day, morning and evening, for between 20 and 30 minutes. It may take a time to develop this discipline and the support of a tradition and community is always helpful. Meditation has the capacity to open up the common ground between all cultures and faiths today. But why can we speak of 'Christian meditation'? Firstly, the faith with which you meditate – some sense of personal connection with Jesus. Secondly, the historical scriptural and theological tradition in which we meditate. Fourthly, the other means by which our spiritual life is nourished: the other enriching forms of prayer like scripture, sacraments and worship. Meditation does not replace other forms of prayer. Quite the reverse, it revives their meaning. Finally - but this is central to any understanding of meditation - we meditate in order to take the attention off ourselves. (Jesus said, leave self behind). In the Christian tradition, contemplation is seen as a grace and as a reciprocal work of love. Not surprisingly, then, if we find we become more loving people as a result of meditating this will express itself in all our relationships, our work and our sense of service especially to those in any kind of need. Meditation is both solitary and communal. You can connect with others who meditate through these pages and so find your journey deepened and strengthened. There is much to learn about this tradition which enriches and stimulates us. The WCCM School of Meditation helps the new meditator to find their way into the tradition. But the basis of meditation is not reading but personal practice. As John Cassian said in the 4th century: ‘experience is the teacher’. The great challenge to us in learning to meditate is its simplicity. Nothing inspires people of all ages and cultures to meditate than realising how simply and directly children can learn both to meditate and to love the practice - and all it brings to their lives. Heavenly Father, open our hearts to the silent presence of the spirit of your Son. Lead us into that mysterious silence where your love is revealed to all who call, 'Maranatha…Come, Lord Jesus. May this group be a true spiritual home for the seeker, a friend for the lonely, a guide for the confused. May those who pray here be strengthened by the Holy Spirit to serve all who come, and to receive them as Christ Himself. In the silence of this room may all the suffering, violence, and confusion of the world encounter the Power that will console, renew and uplift the human spirit. May this silence be a power to open the hearts of men and women to the vision of God, and so to each other, in love and peace, justice and human dignity. May the beauty of the divine life, fill this group and the hearts of all who pray here, with joyful hope. May all who come here weighed down by the problems of humanity leave giving thanks for the wonder of human life. We make this prayer through Christ our Lord. Amen.